We were at the Menlo Park farmers’ market soon after it opened this morning, earlier enough that a number of the participating vendors had time to chat before the market got jammed with customers. Matt Hayes, owner of Salinas Valley-based Bounty of the Farm, reported that last week brought the first frost of the Fall, meaning the tomato season is about over. “It will be a blessing if we have anymore by Thanksgiving,” he said. 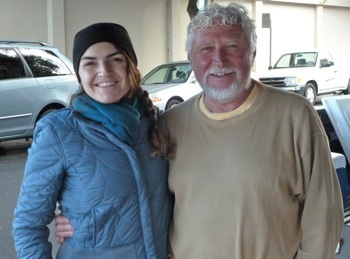 Pietro Parravano (pictured right) was excited about the upcoming Dungeness crab season, which begins on Nov. 15 in local waters. “The season looks promising from both an abundance and size standpoint,” he said. 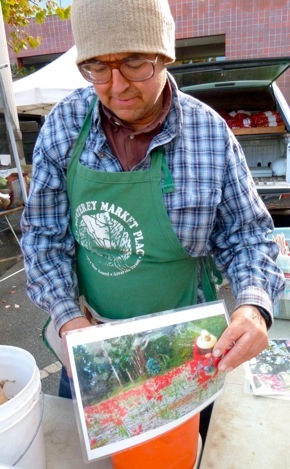 Pietro, who is a steady presence at the market, warned that he won’t be there next Sunday (Nov. 13). Bill the Bulb Baron is making his annual market appearance for the third week in a row, for the first time at his usual place on the southside about mid-market. He said that he’s has plenty of Amaryllis bulbs and recommends, in particular, his modern Freesia. 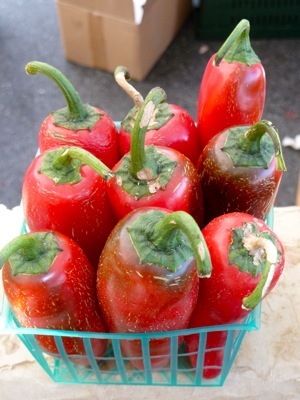 Just as we were leaving the market a basket of Ben Lucero’s hot peppers caught our eye, which we felt compelled to photograph because they make us happy with their organic good looks.